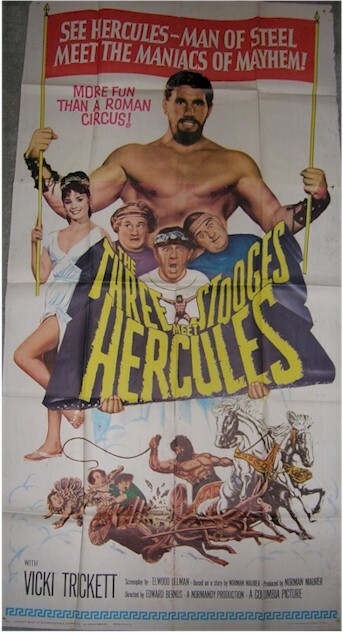 1961 - ORIGINAL One Sheet (27x41") for "Three Stooges Meet Hercules". Excellent condition. 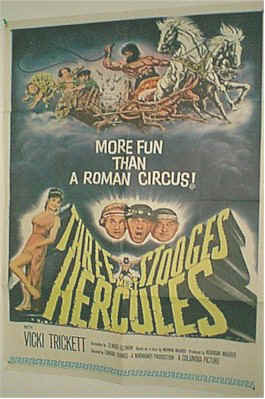 1961 - Here is a VERY RARE Three Sheet (41x81"). The first we have ever seen on this title! Great bigger then life size artwork and graphics. Excellent condition. Like al three sheets comes in two section. 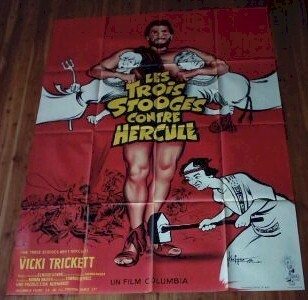 VERY RARE ORIGINAL French Release (47x63") . Beautiful artwork . This release rarely ever shows up n the market. Excellent condition. 1961 - Original vintage half sheet (22x28"). Very good condition. 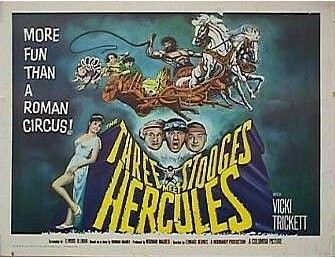 1961 - TITLE CARD (11x41") for vintage "Three Stooges Meet Hercules". 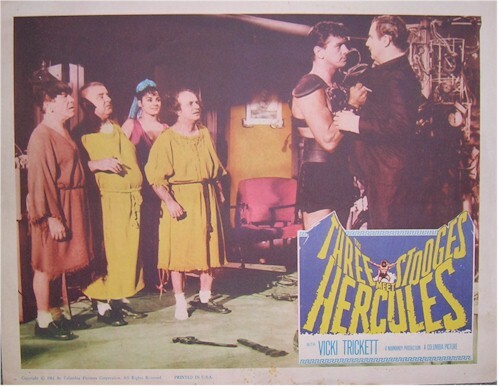 1961 - Great colorful vintage "Stooges Meet Hercules" lobby card. 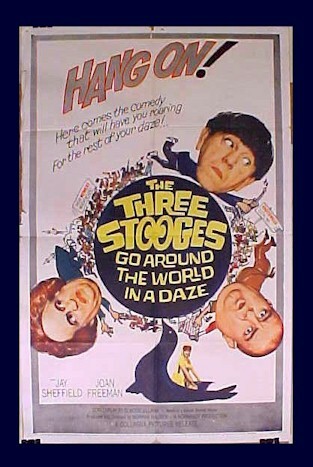 1962 - Beautiful vintage Three Stooge one sheet (27x41"). 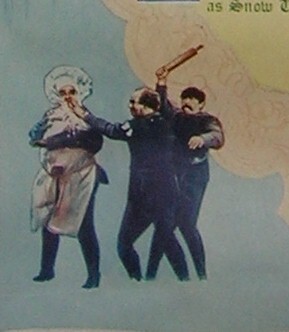 Some of the BEST vintage Stooge artwork and graphics. Excellent condition. 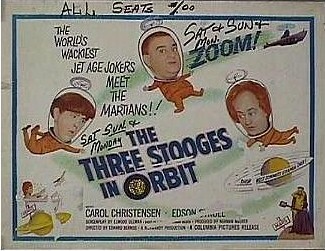 Three Stooges in Orbit half sheet (22x28") has some paper tears across credits, Larry's hand and a couple other small spots. 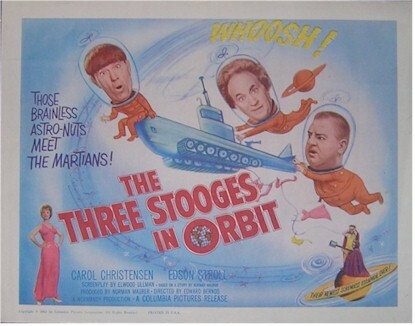 However, it is still a great vintage poster with great graphics of the three!! Has some writing on it from the theatre, i.e. "All Seats $1,00", which adds to it's vintage authenticity..when were movie seats last $1.00 each?? 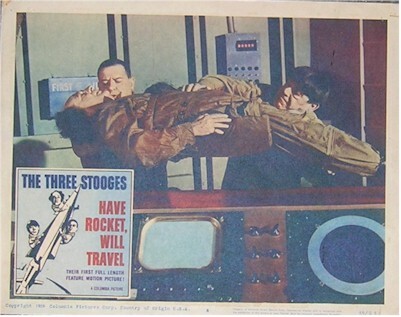 1962 - Original vintage lobby card. 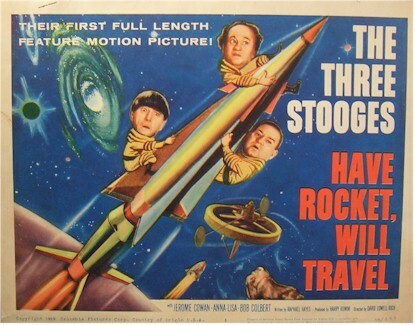 "Have Rocket Will Travel" - 1959 - Their First Feature Film! 1959 - RARE Original Title Card (11x41"). Excellent condition. 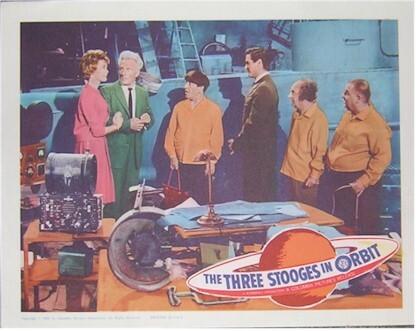 1959 - Great vintage lobby card with Larry gravitating. 1963 - Original Vintage One Sheet (27x41"). Excellent condition. 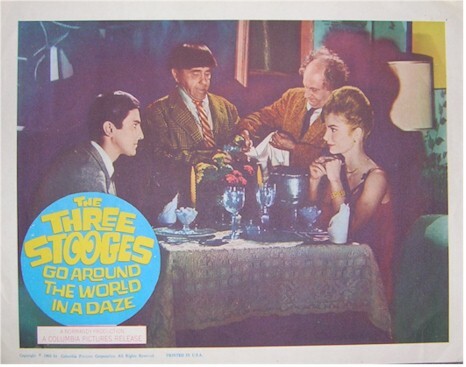 1963 - Original vintage Lobby card . Scene showing Moe and Larry as waiters, Yikes! 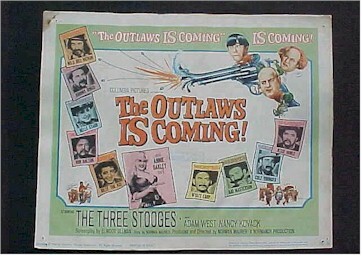 A great Title Card from the 1965 Three Stooges feature "The Outlaws is Coming". 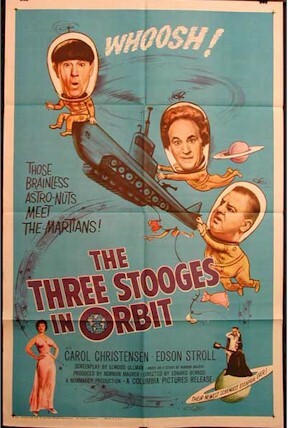 If you collect movie posters I don't need to tell you about the outrageous increasing value of Stooge items! 1965 - Original One Sheet. Good condition with some minor miss missing upper right corner, not affecting image area at all. 1960 - Great original vintage lobby card (11x14"), color, with CURLY! 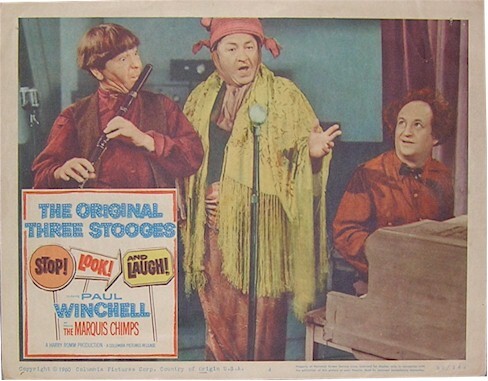 1961 - Rarely seen original vintage insert (14x36") for this Three Stooges classic teamed up with Disney's Snow White.